Atiu Creek has been on the “we must do that one day” list ever since we first starting camping in the Auckland Regional Parks so, as the school holidays were (all too) quickly drawing to a close Issy and I made a spur of the moment decision to head to the Tapora peninsula for the night. 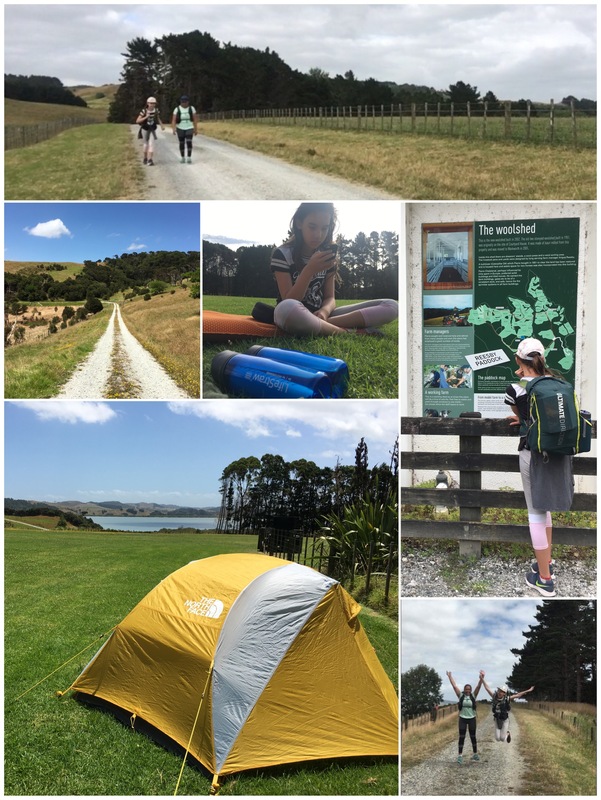 The campground at Atiu Creek is situated on the far side of the park – approx 3.1km from the parking area, it’s also (perhaps more importantly for this post) right on the Oruawharo River Trail an 8km loop that circumnavigates the park. To make our adventure slightly more “adventurous” we decided to slow-pack, which is kind of like fast-packing, but obviously .. slower. 😉 From my completely non-existent map reading skills I approximated that if we traversed the loop in a clock-wise direction that the campground was located about 3/4 of the way around, so I made the decision to walk the long way there (as we’d be fresh) and then we’d only have a short walk out – which is handy for an old creaky body like mine after a night on a thin layer of air. We didn’t require as much gear as when we went to Motuihe, so Issy’s pack was much lighter, I hoped that this would help her walk the longer distance and (bonus) it would be a good practice run for another one of our “must do one day” items – an overnight trip to Motutapu (which includes walking from Rangitoto with a fully laden pack). I parked the car and we grabbed our gear and headed past the toilet block towards the locked gate. Further along the road past the two pou that greet visitors the road continues down the hill towards the campground (which is how if you are driving you get to the campground). Straight ahead is another locked gate, this is the direction we went. It was here that Miss 11 asked if we could turn back and follow the road because the gate had the following LARGE sign attached to it .. The sign is even RED! 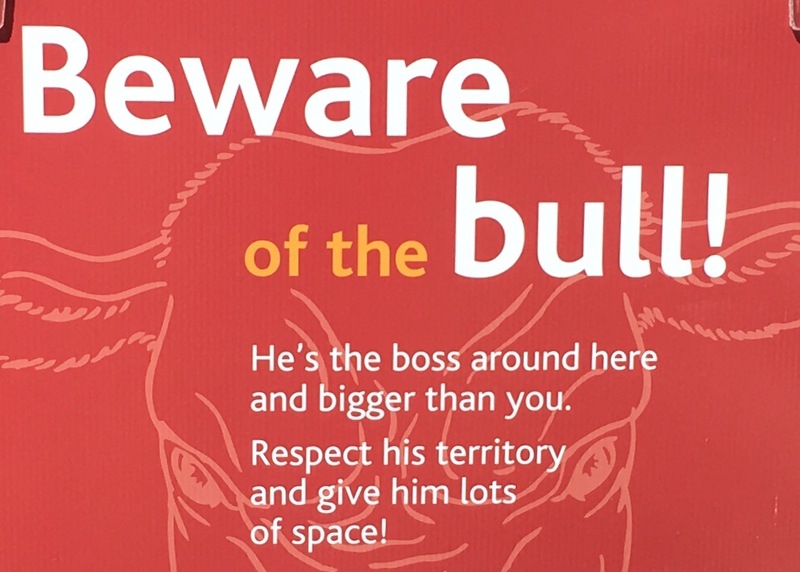 Now I’m not even a fan of cows – so bulls .. ?!?! Even I *slightly* hesitated BUT we’d driven so far that it seemed a waste to not even attempt the loop track so I asked Issy if she would be brave enough just to walk to the first marker (about 100m in the distance) to see what was up ahead. I reasoned with her that the bulls may not even be in this area so it wouldn’t hurt just to have a look reassuring her that we could always turn back. She practically cowered behind me and whimpered for the first section, but as soon as we rounded the bend and we could see empty paddocks for quite some distance she settled into our walk and switched to moaning about the size of the hills. To be fair, it was quite steep in sections, especially near the start (and even more so if you’re a slightly built 11 year old with a pack on your back) and to make things worse, there was no shade until you reached the forested section so some complaining was reasonably justified. You can actually see the campground from the pou, which was great, because Issy was getting super hungry by then. As we passed by Solomans Bay she she asked to stop (because there was a picnic table) but because the gate was locked and I told her we’d have to jump over she decided to carry onto the campground. She was sure that because the gate was locked we’d be breaking the rules and if one thing Issy won’t do – ever – is break rules. Bless her. The Atiu campground is large, mostly flat and has great facilities but it doesn’t offer much in the way of shade so we spent most of the afternoon under the large trees that line the back fence line looking towards the water. 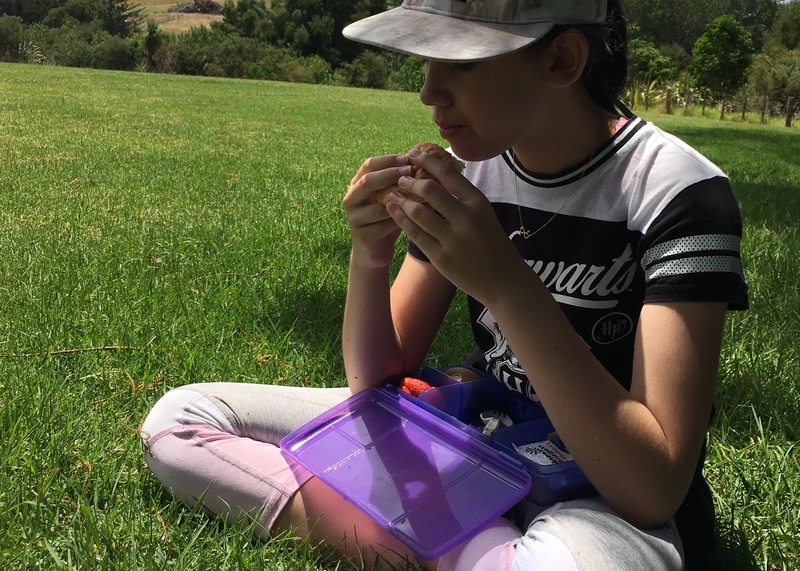 I will mention that if you come to stay here, bring insect repellent – as there are a TONNE of flying bugs that like to bite oh and stick insects the size of small logs … but your inspect repellent isn’t going to do much about them (neither is screaming which is Issy’s “weapon” of choice.) lololol. After an afternoon chilling in the shade and an early dinner we both went to sleep super easily. 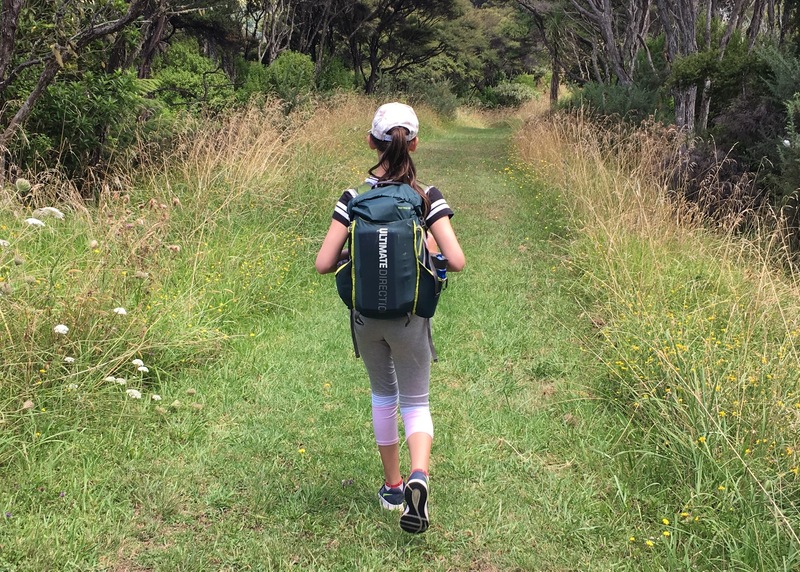 I’d offered to run the 3.1km out to get the car so that Issy wouldn’t have to continue but she assured me that she’d be fine – after all Mum “it’s half the distance – right?” So we set off early the next morning to follow the Oruawharo River Trail back to the carpark. After traversing the first section of the trail the day before, we both knew we’d have to ascend some kind of hill to get back and although it’s a shorter distance to traverse it’s much steeper (in fact it’s pretty much one long continual climb) which Issy wasn’t too thrilled about so when I finally rounded a corner and exclaimed “I can see the car” she nearly burst into tears of joy!